Nanyang Technological University, Singapore (NTU Singapore) and Delta Electronics are expanding their research efforts in innovative manufacturing processes, and in improving learning and living experiences. The S$45 million Delta – NTU Corporate Laboratory for Cyber-Physical Systems was launched in 2016 with the support of the National Research Foundation (NRF). The partners are opening a second laboratory space to accommodate the expansion in research activities. The joint lab has developed innovative solutions such as a universal smart navigation system where logistics robots autonomously move goods around factory floors. The expanded lab already has 15 projects. These projects aim to improve and streamline industry processes and enhance learning technologies by integrating computation, networking, and physical processes or what is known as cyber-physical systems. Apart from the smart navigation kit, the researchers have also developed a reconfigurable testbed that will allow factories to digitise and change their production line processes quickly. This is especially beneficial for manufacturing plants as they can quickly adapt to changes and continue to develop innovative products. These technologies are testbedded on NTU's Smart Campus, which is home to a wide range of innovations developed with leading industry partners. 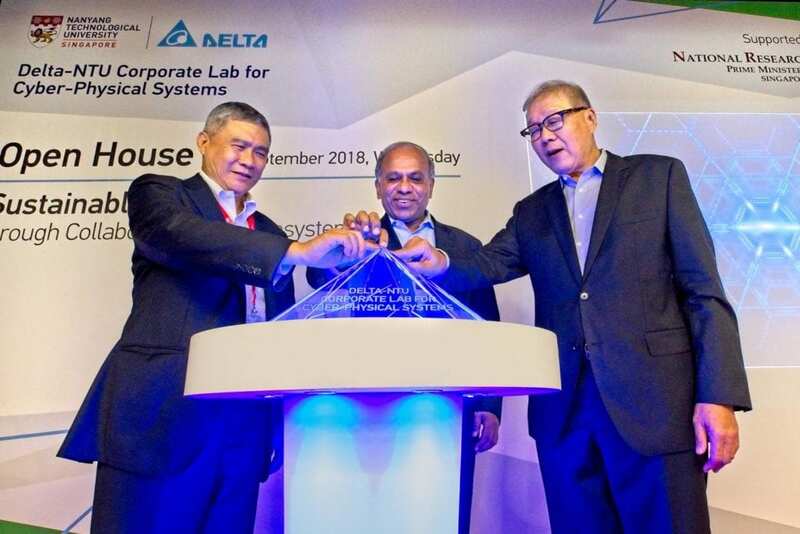 NTU President Professor Subra Suresh said, "In a short span of two years, the Delta-NTU Corporate Laboratory has developed innovative solutions that can help companies stay ahead of the curve by embracing cutting-edge cyber-physical systems. "The early successes of the partnership and the expansion of its research activities are aligned with the NTU Smart Campus vision, where we harness the power of digital and advanced technologies to support the discovery of new knowledge, and promote better learning and living experiences." Delta Electronics CEO, Mr Cheng Ping, said, "Delta has a rich history and great success in collaborating with academia, a value continuously promoted and supported by our founder Mr. Bruce Cheng. As a corporate citizen, we truly believe that cultivating talent and nurturing innovation are the keys to a sustainable future." The Delta-NTU Corporate Lab is one of 12 Corporate Labs supported by the NRF, which facilitates the setting up of Corporate Labs via public-private partnerships. NRF CEO Professor Low Teck Seng said, "Researchers at the Delta-NTU Corporate Laboratory have made headway in the development of advanced robotics and sensor technologies that can automate operations and improve productivity in our manufacturing and logistics companies. We believe that companies need to embrace the latest technologies to stay competitive in today's economy, and we look forward to see how the technologies developed in this lab can be adopted by companies to improve processes and generate more returns." Since 2016, the Delta-NTU Corp Lab has filed five patent submissions, secured two licenses, and published about 50 papers. It also supports more than 60 NTU research staff and graduate students, as well as scientists and engineers from the Delta Research Centre in Singapore. The expansion of the lab has accommodated the rapid growth in research activities and also allows the joint research team to explore several new projects that involve partners from industry, government and academia. The innovations developed by the Corp Lab are commonly referred to as cyber-physical systems, which combine physical objects and virtual systems to create a networked world of intelligent cyber-physical elements interacting through the Internet. The research projects focus on four broad research areas: smart manufacturing, smart learning, smart living and smart commercialization. Under the Smart Manufacturing Track, the universal smart navigation kit for portable robots – known as automated guided vehicles (AGVs) – can be deployed in various industrial environments. They use sensors, and magnetic tapes or QR codes on the floor, to move materials and goods around a manufacturing facility or warehouse. The new kit will increase AGVs' flexibility with enhanced navigation abilities such as obstacle detection, trajectory planning, and even automatic docking and charging. It will also be equipped with advanced laser-based sensors to generate a map of its surroundings, detect obstacles, and prevent collisions. With enhanced navigation capabilities, AGVs would be able to operate in any complex environments beyond factories such as hospitals and airports. Another project involves developing a reconfigurable testbed, which will enable factories to easily digitise and modernise their manufacturing processes. Known as IMPACT, the Industry 4.0 system integrates cyber-physical systems and allows factories to benefit from automation, artificial intelligence and the Internet-of-Things. Factories and manufacturing facilities would not only be able to quickly testbed working prototypes but conduct production line changes within ten minutes. Under the Smart Learning research track, the Corp Lab has developed a Smart Learning Platform that will equip professionals and enterprises with the latest Industry 4.0 skills. Supporting Singapore's SkillsFuture initiative, the platform will combine the latest information from industry and data generated from participants' learning proficiency to create a customised content package that will enhance the overall learning experience. The platform is designed as a collaborative tool which will help participants connect and learn alongside others, exchanging information seamlessly. It also provides multiple scenarios that match different levels of competencies and skills. 'Interactive markers' that function as bookmarkers and notes will help participants ease into the various learning scenarios. The research team is currently working with NTU's College of Professional & Continuing Education to explore more ways to provide lifelong learning opportunities for industry professionals. For more information, visit http://www.ntu.edu.sg. Delta, founded in 1971, is a global provider of power and thermal management solutions and a major player in several product segments such as industrial automation, displays, and networking. Its mission statement, "To provide innovative, clean and energy-efficient solutions for a better tomorrow," focuses on addressing key environmental issues such as global climate change. As an energy-saving solutions provider with core competencies in power electronics and innovative research and development, Delta's business domains include Power Electronics, Automation, and Infrastructure. Delta has 169 sales offices, 70 R&D centres and 38 manufacturing facilities worldwide. For detailed information about Delta, please visit: http://www.deltaww.com. For more information, visit http://www.nrf.gov.sg/RIE2020.